Zack Greinke is headed back to Los Angeles, but he won't be re-signing with the Angels. The Dodgers announced today that they have signed the free agent right-hander. He'll obtain a six-year contract worth $147MM from the Dodgers, according Gina Miller of TXA21 (Twitter links). Greinke is represented by Casey Close of Excel Sports Management. Jim Bowden of ESPN.com and MLB Network Radio has the contract breakdown (on Twitter). Greinke will receive a $12MM signing bonus with a $17MM salary in 2013, $24MM in 2014, $23MM in 2015, $24MM in 2016, $23MM in 2017, and $24MM in 2018. Bowden reports (on Twitter) that Greinke did not receive a no-trade clause with the contract. Greinke has a full player opt-out clause after the third year of the deal, Bowden reports (via Twitter). Furthermore, if Greinke is traded during the course of the contract he can opt out at end of year. Because he was traded at midseason, Greinke was not eligible to receive a qualifying offer and will not require draft pick compensation. The Dodgers don't surrender a pick and the Angels don't obtain one. Greinke, 29, was the free agent market's top pitcher and top overall player according to MLBTR's Tim Dierkes. The Angels and Rangers were among his suitors. 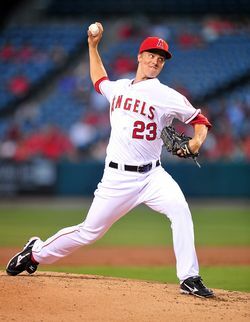 The 2009 AL Cy Young Award winner pitched to a 3.48 ERA with 8.5 K/9 and 2.3 BB/9 in 212 1/3 innings split between the Brewers and Angels in 2012, his fourth 200+ inning season in the last five years. Tim predicted Greinke would re-sign with the Halos. Check out where you rank in our Free Agent Prediction Contest. Greinke's deal smashes Matt Cain's record for the largest contract given to a right-handed pitcher in baseball history. Cain signed a five-year, $112.5MM pact with the Giants earlier this year. Greinke's contract is comparable to the six-year, $144MM deal given to Cole Hamels by the Phillies this summer. It's worth noting that neither Cain nor Hamels were free agents at the time of their deals. Greinke's $24.5MM average annual value is the new record for a pitcher on a multi-year contract, surpassing CC Sabathia's $24.4MM average annual salary with the Yankees. The Dodgers have become baseball's biggest spender since Guggenheim Baseball Management purchased the team from Frank McCourt for more than $2 billion back in March. They absorbed over $300MM in payroll obligation in July and August alone, most of which came from their blockbuster with the Red Sox. Los Angeles will become the first ever NL team with a $200MM+ payroll this year and they figure to boast the largest payroll in MLB history. They will also be the second team ever with four players making $20MM+ annually (Greinke, Adrian Gonzalez, Carl Crawford, Matt Kemp). With Clayton Kershaw, Josh Beckett, Chad Billingsley, Ted Lilly, Chris Capuano, and Aaron Harang already under contract, the Dodgers figure to trade one and possibly two starters before Spring Training. Both Harang and Capuano have been on the block this winter. Greinke's contract figures to have a direct impact on Kershaw, who is scheduled to become a free agent after 2014 and is in line for a massive nine-figure contract of his own. Jon Heyman of CBSSports.com (Twitter links) helped break the news while Tim Brown of Yahoo! Sports, Dylan Hernandez of The Los Angeles Times, and MLB.com's T.R. Sullivan reported the two sides were close to a deal. Photo courtesy of US Presswire.